Responding to reports of environmental contamination  in gas drilling areas across the country, the U.S. Environmental Protection Agency will conduct a nationwide scientific study  to determine if the problems are caused by the practice of injecting chemicals and water underground  to fracture the gas-bearing rock. The study, announced Thursday but hinted at for months, will revisit research the agency published in 2004 , which concluded that the process of hydraulic fracturing  did not pose a threat to drinking water. The 2004 report has been widely criticized, in part because the agency didn't conduct any water tests in reaching that conclusion. "The use of hydraulic fracturing has significantly increased well beyond the scope of the 2004 study," EPA spokeswoman Enesta Jones wrote in response to questions from ProPublica. 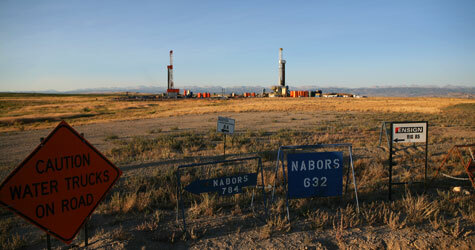 The old study, she said, did not address drilling in shale, which is common today. It also didn't take into account the relatively new practice of drilling and hydraulically fracturing horizontally for up to a mile underground, which requires about five times more chemical-laden fluids than vertical drilling. "This study is the agency's response to public concern about this practice and Congressional request." The 2004 report was used by the Bush administration and Congress to justify legislation exempting hydraulic fracturing from oversight under the Safe Drinking Water Act. The exemption came to be known in some quarters as the "Halliburton loophole" and has inhibited federal regulators ever since. The fracturing technology, in which a mixture of chemicals and water is injected underground with sand at high pressure to crack the earth and release natural gas, made it possible for energy companies to open vast domestic energy reserves across the country and fueled a nationwide boom in drilling activity. "EPA needs to finish what it started," said Gwen Lachelt, director of the Oil and Gas Accountability Project, a Colorado-based advocacy group that represents landowners with contaminated water. "We need comprehensive studies of the entire exploration and production process, but this is an important place to start." The American Petroleum Institute released a statement saying it expects the study "to confirm what 60 years of experience and investigation have already demonstrated: that hydraulic fracturing is a safe and well understood technology for producing oil and natural gas." Lee Fuller, vice president of government affairs for the Independent Petroleum Association of America, said hydraulic fracturing is one of the industry's "crowning achievements." "Adding another study to the impressive list of those that have already been conducted  and completed is a welcome exercise," he said. A series of investigations by ProPublica  found that fracturing is the common thread in more than 1,000 cases of water contamination across seven states . In some cases fracturing may have caused dozens of well failures where  the concrete or steel meant to protect aquifers from the gas and drilling fluids cracked under high pressure, allowing contaminants to seep into the water. In hundreds of other cases the waste and chemicals generated by hydraulic fracturing have been spilled or seeped into surface and groundwater supplies. Fuller said that Congress' efforts to allow the EPA to regulate  the process "should come to a standstill until this study is completed." More than 50 members of the House of Representatives have co-sponsored the Frac Act , a bill that would reverse the drilling industry's exemption from the Safe Drinking Water Act and allow the EPA to regulate fracturing if it chose to do so. The Frac Act also would require companies to disclose the chemicals pumped underground in the process -- information that is usually protected as trade secrets. The House Energy and Commerce Committee is also conducting a separate investigation  of hydraulic fracturing's impact on water resources. The EPA has yet to say exactly how the new study will be conducted or when it will begin, but sources within the agency told ProPublica that it will likely involve a number of EPA regional offices in Colorado, Texas, New York, Pennsylvania and elsewhere, and could build off two related investigations  the EPA is undertaking in Wyoming gas fields. In its announcement  Thursday, the agency said it will spend nearly $2 million on the research this year and is asking for more money for next year. It promised a transparent, peer-reviewed process that includes stakeholder input. The EPA is seeking input from its Science Advisory Board on exactly how the study should proceed.